AAA SPECIAL BOATSWAIN'S MATE PACKAGE DEAL! KEYCHAIN, MONKEY'S FIST AND SHACKLE Solid Brass/Copper Diving Helmet Key Chain 5"
KEYCHAIN, MONKEY'S FIST AND SHACKLE. 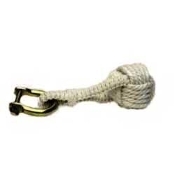 CAN ALSO BE USED FOR A BELL ROPE ON A SMALL 4, 5, OR 6 INCH BELL. Solid Brass/Copper Diving Helmet Key Chain 5"
Copyright © 2006-2019 THE BOSN'S LOCKER. All rights reserved.